One of the reasons Spider-Man endures, as a profitable property and a popular icon, is that he remains an underdog—the superhero who can save the city, but not his friendships or relationships or GPA. Sure, swinging across the Manhattan skyline may be a blast, but it’s hardly compensation for what crime-fighting does to a young man’s personal life. In The Amazing Spider-Man 2, the webhead’s latest cinematic stint, radioactive teen Peter Parker (Andrew Garfield) has a lot on his plate. The film opens, in a crosscutting flurry of action, with him nearly missing his high-school graduation to stop a hijacking in process. From there, things only get more complicated: The hero’s haunted by guilt over the death of his girlfriend’s father (Denis Leary); by the fear that he’ll end up drawing said girlfriend, Gwen Stacy (Emma Stone), into the crossfire; and by a burning curiosity about the parents who abandoned him. And that’s to say nothing of the superpowered heavies out for his masked head. As always, and in the immortal but paraphrased words of his dead uncle, Parker grapples with the great responsibility that comes with his great power. He’s not alone: The creative team behind this expensive, uneven extravaganza has some pretty weighty obligations of its own. With the power of a nine-digit budget comes the responsibility of keeping a franchise chugging along, of introducing new characters while paying off old conflicts, of planting seeds for future installments. Call that the standard burden of crafting a modern comic-book movie; the good ones, like last month’s Captain America: The Winter Soldier, make the multitasking look easy. Here, it looks about as difficult as trying to balance a stack of graphic novels on a thin strand of gossamer. 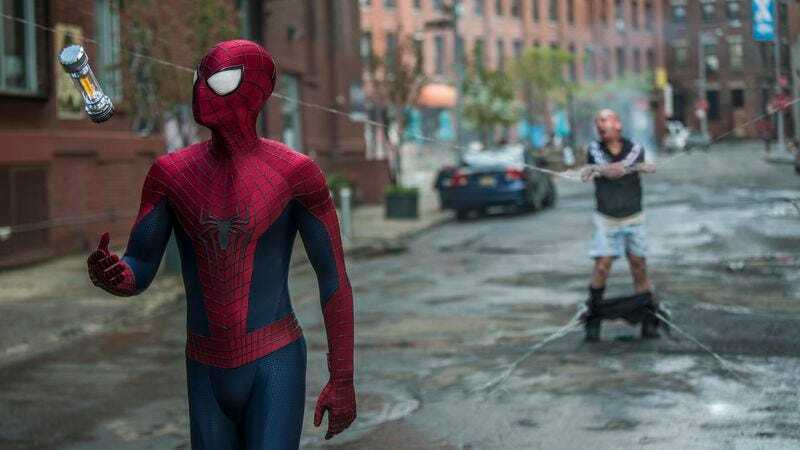 The best that can be said for this busy sequel is that it rarely resembles, as its 2012 predecessor too frequently did, a mere retread of Sam Raimi’s more eccentric Spider-Man movies. Marc Webb, who seemed faintly overwhelmed by his inaugural blockbuster gig, displays greater confidence behind the camera. His first big action scene, a fevered pursuit through rush-hour traffic, has a puckish energy worthy of the source material. And there are a few scenes of spectacular eye candy, as when Webb turns a moment of catastrophe into a CGI tableau, tracking a single spurt of webbing through a dispersing crowd or down a collapsing clock tower. But the script is rarely so graceful. Power duo Alex Kurtzman and Roberto Orci struggle to transition among scenes of city-demolishing combat, indie-rock-scored montages of Peter pouting in his room, and intrusions of corporate-espionage backstory. They’ve written a checklist, not a screenplay. Even at a hefty 142 minutes, The Amazing Spider-Man 2 hasn’t the time for its surfeit of plot, nor for the sprawling ensemble of supporting characters caught in the sticky web Webb weaves. (There’s no room, for example, for Peter’s newspaperman boss, J. Jonah Jameson, who appears only in email form—though maybe that’s for the best, given the unbeatable wonders J.K. Simmons once did with the part.) Dane DeHaan, from Chronicle, brings a sociopathic rich-kid menace to the role of Harry Osborn, heir to the corrupt Oscorp empire. But the movie can spare only a scene or two to develop his complicated kinship with boyhood friend Parker; a relationship that spanned the entire length of Raimi’s trilogy has been condensed into one movie here. Similarly, there’s little Jamie Foxx can do with his villain, walking battery Electro. Kurtzman and Orci position him as a kind of adult-male Carrie, lashing out at a world that’s ignored and mistreated him. His arc, however, never gains any dramatic power; he’s a stalker geek caricature who transforms into a special effect, glowing blue skin and currents of CGI electricity provided in place of an interesting pathology. Wedged among the endless introductions, the flashy light shows, and the groundwork for future sequels are the occasional grace notes, most of them courtesy of Garfield and Stone. It’s no surprise that the director of (500) Days Of Summer most excels at the romantic side of Spider-Man, the scenes of playful rapport between the superhero and the geeky dream girl he’s somehow snagged. The Amazing Spider-Man 2 arrives at a surprisingly poignant climax for the young lovers, one that Garfield—a whiz at wisecracking and brooding—sells with utmost conviction. Yet even that heartfelt punctuation is rendered perfunctory, just another item on the film’s checklist. Perhaps Webb should have just carbon-copied the decade-old second chapter of Raimi’s trilogy, a much more elegant balancing act between drama and spectacle. Now that was an amazing Spider-Man.